Now we have 4 people working to do something that should have been very simple. Yes this does happen....and it happens to me.....and even when I want to cry and give up.....there are those kind folks who keep helping and keep me going. I'm so impressed with how much kindness has been shared with me today. Kindness is the answer and I honestly think it is the prelude to Peace on Earth .....just my thoughts on the subject....and I still think this....even after all this jumbled up blog/website stuff!! RUN FAST AND REMOVE THE BUTTONS and do the steps above because I've been trying for two days to do a Cyber Monday Special.....and everyone will want to know what is was....will be ....right? RIGHT. I had the very good fortune of meeting Sandi Blackwell in Houston for Quilt Market 2010. Sandi's first book is Very Impressive!!! Each time I go to Market I typically find one book or tool that I've never seen before and I think is innovative and truly new. This time it was Sandi's book entitled, " Square-agonals." No Cutting or Setting Triangles! Although Sandi explains the mathematics behind Square-agonlas you don't need to understand the method in order to make any of the 14 patterns in the book. The blocks are sewn together in rows and then the quilt gets cut into three sections and reassembled ....that is what gives you the diagonal set design. You are looking at how the fabric was cut and the tape is "Arrow Guide Tape." The tape makes a great visual guide for cutting as well as stabilizes the bias fabric that you cut. You don't have to purchase the "Arrow Guide Tape" to use her method either....she told us we could use our own tape but that she has developed the tape just to keep things simple. I like that!! When it is sewn back together this is what you have....a diagonal set design without having to ever sew one of those little triangles!!! Now you know why I was impressed right? You have to click here and see all of the quilts that have been made using Sandi's Square-agonals method. You'll be really surprised to see how incredible they are and no one had to sew a triangle. I made certain I was in line to get an autographed copy of Sandi's book, Square-agonals, for one very lucky IHAN blog reader. I was not going to miss this one!!! So if you would like to have a chance to own an autographed copy of Square-agonals please leave a comment on this post telling me why you would like to own this book. I will choose a winner by random on Friday night December, 3rd. Many people asked where they could get the IHAN button.....and here it is....in all it's glory :) It was the fancy work of Gene Black....a wonderful man who created this button just to be kind. And the first that I know of to link to the IHAN store....just because he wanted to. So, if you are so inclined...hop over to Gene's blog and fill his comment box up with any wild thing you want to say. Wait until he gets up for work tomorrow....he is going to flip. Feel free to copy and paste it to your sidebar or your forehead if you so choose. All I ask is that you don't get it tattooed on your body....cuz that would hurt! Good news....actually incredible news here at IHAN. Mr. McSteamy has finally cracked the code to downloading our HD video camera to our bot so I can post some video on my blog. Ya gotta love a guy who spends countless hours getting everything set up....now I'm wondering if he would do the same if I wanted a long arm....better not push it for awhile ay? Who Has The IHAN Blog or Store On Their Sidebar? If you have the IHAN blog on your sidebar as a blog that you read and it shows up on the front page of your blog right now as you read this please e-mail me at IHaveANotion@yahoo.com and let me know. Those of you that have the IHAN Shop on your sidebar, the Shop IHAN or some image of the IHAN store please e-mail IHaveANotion@yahoo.com and let me know. When you send your e-mail, please include a link to your blog. Thanks!!! Sometimes I just want to show a little appreciation....know what I mean? Patsy Thompson Designs is offering free shipping all week (I don't know when the week started so check out the dates) and she has some great things that would be excellent to have shipped in the US for free!!! While you are there, she has posted yet another beautiful design she has made with her Quilting by Design Fabric Cutting System!!! I know most of you have been out shopping all day long. 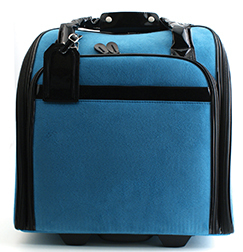 I thought to welcome you back from your crazy shopping adventure with a treat just for you here at IHAN. These items will no longer be available at these prices after midnight tonight Eastern Standard Time. Since you have been shopping for others all day long, I thought you might like a little something for yourself . Edited11/26/10 - Replying to questions asked at the end of the post. The Big Shot is pictured below with some of the newest Quilting By Design Dies. I visited their booth at Fall Quilt Market 2010 in Houston. Some of these photos are from their booth there and some are from my files. 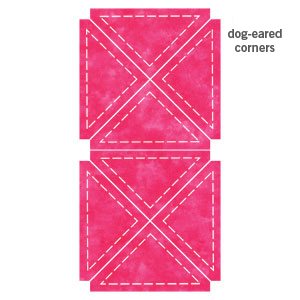 The Big Shot is pictured below with some of the new Quilting by Design Fabric Cutting Dies. 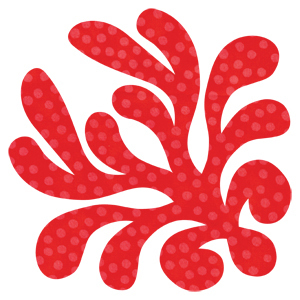 The newest Fabric Cutting Dies are in the process of being added to the IHAN website. Since I've already reviewed the Big Shot and Big Shot Pro I won't repeat all the details here. You can click on the link and read the review. I made a huge, gigantic, enormous mistake when I was organizing my creative space. I took those scraps and disposed of 75% of them. I know....just plain stupid! Well....lets not be-labor the issue. Here is a pix of a larger scrap I did not discard. I'm going to show you some pix of some of the things I've done recently using my Big Shot Pro and my Big Shot (yes I own both....the Big Shot is to travel with and loan to our charity quilters locally). This is my Big Shot Pro (aka the muth-ah of all cutters..lol) I took some strips of Batik that I had and made 5" squares to use as signature squares for a signature quilt. I don't like cutting and sewing alone....these little buggers you see keep me company. This is my Big Shot (aka little booger) and I was taking some scraps to make some fusible appliques to adhere to Tea Towels that I'm giving to a friend who has recently moved. I tape the package insert to the top of the die so I'll see which one it is without having to look at the side of the die. 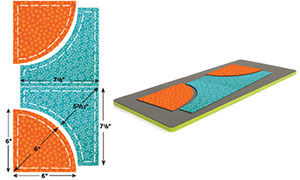 By the way, did you know the Big Shot and the Big Shot Pro will take AccuQuilt Dies? 100% TRUE.....any AccuQuilt Die that is 6 inches wide or smaller will fit into the Big Shot and the Big Shot Pro will take all the AccuQuilt Dies including the Studio Dies. Sizzix carries a Platform and Shim to raise up the AccuQuilt Dies but I use my small Omnigrid Cutting Mat and it works just fine for me. I made all of these fusible applique shapes with my Sizzix Dies (the white show flake is batting). Before I cut my fabric I use Mistyfuse on the back of my fabric so once it is cut I can just fuse it down. 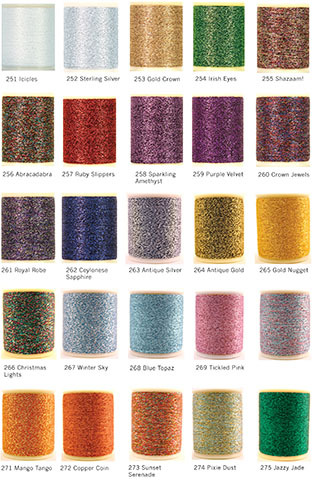 I prefer Mistyfuse because it is light and it does made my appliques stiff. 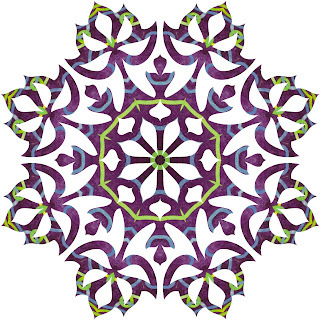 I like this one....and I want to make lots of them and put them around a center focal point. Then smack a big ole flower on top of the tree!!! Gotta love it. 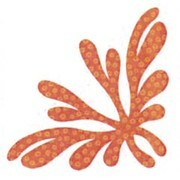 Since many of the Sizzix Dies I use are also for Scrapbooking they have small details that sometimes connect. I like to carefully trim those areas away. On the left are scissors I own and use. On the right are how they look in the package. They are all excellent scissors. Just to be kind to all of those folks who get funky things going on with their hands and can't use the manual fabric cutters....I'm going to offer a FREE Sizzix Applique Die of my choosing to anyone who buys a Sizzix Big Shot, Big Shot Pro, or a Vagabond Cutter from IHAN on or before Monday, November 29th, 2010. You might want to see what Patsy Thompson has made with her Sizzix Dies!! 1. Will the Vagabond cut several layers of fabric? 2. 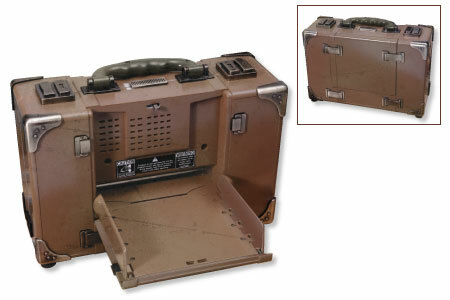 Do I have an exact delivery date for the Vagabond? Answer: No, I was told they are currently shipping so I'm guessing it won't be long but I don't have an exact date. 3. Will the AccuQuilt GO! and GO! Baby take the Sizzix Dies? Answer: No they will not work in the AccuQuilt Cutters and if you try it and jam your machine, your warranty is voided so don't do it....even if you think it "might" fit....trust me....I've done it and your cutting mat will curl and you could easily break the handle off. Blogger won't let me upload photos for some reason....however I am grateful to have the Internet. Today I'm hosting 13 of my family members for our Thanksgiving Meal....and I am grateful that they are all healthy and here. This morning the heating coil in our oven caught fire and Rick had to go to 4 different stores to get a new one....and I am grateful there are 4 stores he could go to and that he found one. I went to put the turkey back into the fridge and as I turned to put it in...the milk spilled all down the shelves...and I'm thankful that we have a Turkey and a fridge. I could go on and on....but without photos....it is not nearly as much fun. Happy Thanksgiving to you and your families and friends. May you all have save travels and eat only enough to fill your stomach so you don't feel stuffed and sick....LOL. No need to get up at 3 AM to shop at IHAN. I'm a kinder and gentler sort of retailer :) Shop anytime 24 hours a day and you still get the same good price. 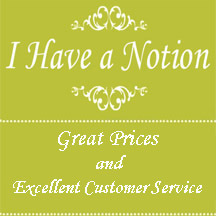 How often have you seen the word "Sale" at http://www.ihavea-notion.com/ ? You don't see "free shipping" either. Ever wonder why? Why no free shipping? Because I would have to pay to ship your order and frequently that would mean I would work for very little or nothing. Hmmmmm.....I would not suggest to anyone that working for free is a good thing.....unless you have agreed to do that in advance :) Now if USPS and FedEx wants to ship for free....then you know for sure I'm all over that and your order will definitely ship for Free!!! But you do see "Giveaway" often on the IHAN blog. I love to do giveaways because it gives people just like me a chance to try something new, read a book they might not have otherwise considered and sometimes to simply lift the spirits of someone who might benefit from something fun in the mail. Since opening IHAN I've learned that advertising can mean something as simple as letting people know I'm here and open for business. No tricks no gimmicks....just a simple Howdy....come on over if you like. It was another blogger that taught me about advertising.....a simple thing really. Gene Black, from ArtbyGene Blog, made a button and put it on his blog to let others know IHAN is a shop and it is here on the Internet. I have been absolutely floored and appreciative for those folks who have shopped at IHAN and on their own accord have spread the word. What I love the very most about IHAN is this blog. Blogging has changed my day to day life and the way I look at the world. I thank each and every one of you for reading, leaving comments, sharing and being a part of my experience. I want to thank everyone left a comment and visited Blue Moon River. I wonder how many of you clicked on the photos in Susan's Gallery? Did you know if you click on the photos that a description of the work pops up and some of them are for sale? I clicked on one just by chance and then clicked on all of them. I would say they are extremely reasonably priced too. Oh I so badly want this DVD myself it is going to be tough to put it in the mail tomorrow....good think it is sealed in cellophane....I would not have been able to stop myself from watching it. Love everything Susan does, but I must admit her chickens were unbelievable. I'm still wondering what she sold that piece for. It was so amazing! I'd love to own her/your DVD..I've just started trying to teach myself some thread painting on the art quilts I donate to AAQI and I'm sure I could use more than a few tips!!! Please e-mail me with your full name and address so I can get your DVD into the mail before I open it and watch over and over and over again. Stay tuned....more giveaways are on the way. If you are not a follower, you may want to become a follower because there will be some giveaways for followers only (subscribing to the blog by e-mail or RSS feed won't work to be eligible for those giveaways). You have a few days, but I thought some of you may want to know. It should come as no surprise that this is right up my alley!!! The freedom of allowing the mind to play ....and the joy that comes out of the journey....ahhhhh....definitely my kind of fun. First, I want to thank the blogger who sent me an e-mail reminding me about the drawing last night. I'd like to say I drew the number last night like I promised.....but I got busy and it slipped my mind. I am going to have myself electronically reminded of such things so I don't forget. Please forgive my tardiness. I fell head over heels in LOVE! with the Rose of Sharon quilt the first time I saw a picture. It is my must make! - one day. Thanks for the chance to win the autographed (Wow!) book. Happy quilting! Ann Rutter was the presenter for the Schoolhouse EQ session. This is just a photo of some examples that were gone over. 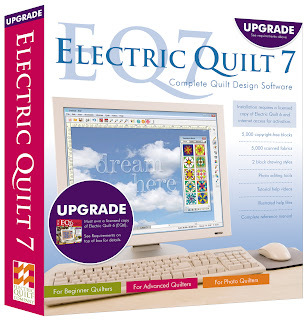 I have to say, I don't think there is a software program anywhere that is as "teachable/learn-able" than EQ 7. I'm not just saying that because I sell it either. Most of you know I'm a person of my word. When I embellish the truth I make it clear that either I'm telling a joke or I write (lie) at the end of what I said. So this my friends, is a FACT!!! 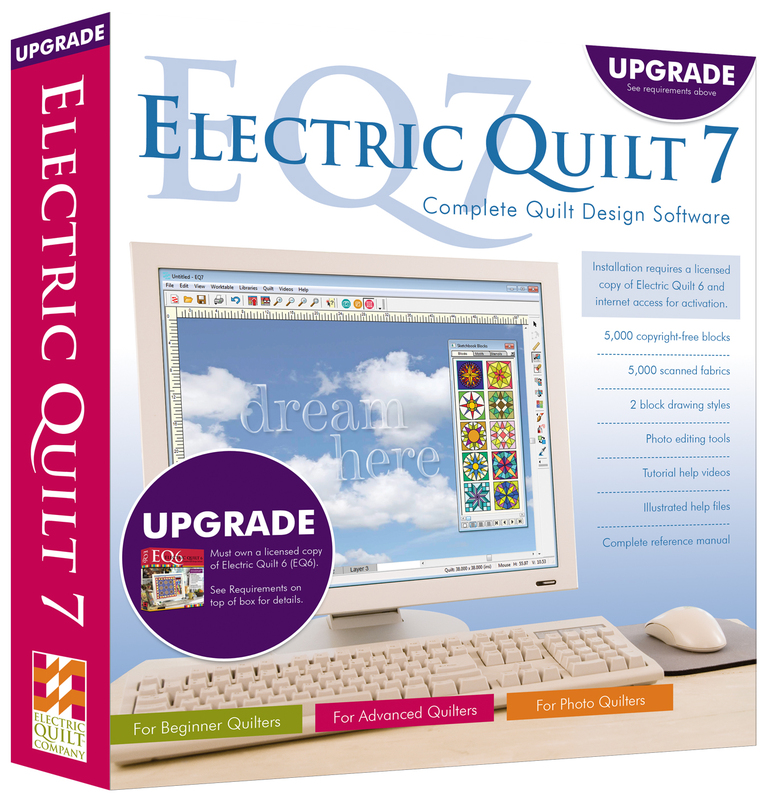 If you can read and and follow a one step directive, than you can design your own quilts using EQ Software. There were computers set up for smaller demonstrations and people were able to use the software in their booth too. I'm in EQ Heaven here....see the stars and the clouds....I hear angels singing (kidding...no angels....just the announcer over the PA telling folks the lunch area was open). Ohhhhh Ahhhhhh....all the fun stuff together on a wall. Oh yeah, how about some Quilting Software to develop your plan for quilting the project you just designed on EQ 7? Yep, they have it all there for you....you can't get any easier than this. The people at The Electric Quilt Company are not cold phone operators or techies that talk "techno speak." They are people with a passion for what they do. They are kind, thoughtful, warm and very friendly. Don't believe me? Just call them anytime...( 1-800-356-4219) ask a question.... see for yourself....then you'll know personally that what I'm telling you is true. I'm sure there are things I missed to. 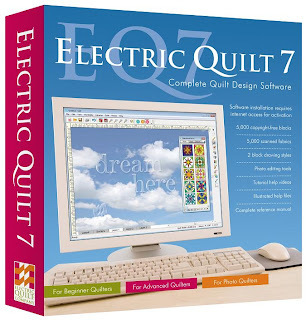 The Electric Quilt Company gets a 4 Star Rating from IHAN for their incredible Electric Quilt 7 Software and their sincere desire to help people be successful in designing their own projects. They care about their customers and the people who sell their software. That is really saying something these days. I have found many companies care more about making money then they do customer satisfaction.....if you have shopped with IHAN you know that is not the case here and it certainly is not the case at The Electric Quilt Company!!! Susan gave a great Schoolhouse presentation during Quilt Market in Houston this year. Her presentation included a slide show which made it difficult to take photos. I love this photo....except for the crease in the wall!! "Vanity" is the name of this piece. It is 11 x 11 and was on the cover of Quilting Arts Magazine for April/May 2010. Check out Susan's blog. When you get there make sure you scroll down and look along the right side of the page. 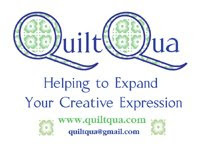 Many of her pieces are on the cover of Quilting Arts Magazine. Her work is absolutely beautiful and it is no surprise that she is featured on the cover of these magazines. Here is Susan in my sewing area!! 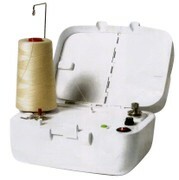 No she does not live next door.....I bought her Master Machine Quilting - Free Motion Quilting and Thread Sketching DVD. I have admired Susan's creations and having a personal class with Susan (via my laptop) is the only way to go - with my schedule. I buy DVD's because I'm a visual learner and really appreciate the flexibility of being able to watch over and over again. This is a little snippet from Susan's DVD. I have never done any thread sketching in my life. I have been struggling with finishing a backpack that I made. I want a beautiful embellishment on the back of it and I finally found a pattern I like. Below is a photo of some practicing I did yesterday morning. I did some free motion quilting with invisible thread and then on one of them I used some small cording to make the veins pop up. It looked ok, but nothing special. I thought about doing some hand embroidery and beading but then I remembered Susan's DVD. Look how much different the leaf looks with some thread sketching on it. Now I know Susan sketches on top of applique that she has done herself. But I did not find it written anywhere in the quilting police policies that says you can't sketch on top of patterns that someone else has already given you on the fabric!!! It was so much fun I was actually ticked off royal when I had to stop and go to an appointment. No joke. Keep in mind this is my very first piece. It is intended only for practice and I have the one I will use on my backpack set aside until I feel like I've practiced with the colors of thread that I will end up using. I think there is a huge difference between this one and the one with quilting only. Susan is an excellent teacher and the free motion quilting and thread sketching is tons of fun. Her DVD, Free-motion Stitching and Thread Sketching is an wonderful resource if you are wanting to learn either of these techniques or would like to build on your current skills. Susan was very clear in her explanations and the video captures each step Susan was teaching. She encourages exploration and gives her students lots of permission to "just do it." Typically I would be afraid to try something new and tell myself I can't do it-because I've seen so many incredible works of art and I know mine would look nothing near that quality. But....oh contraire....look how cool the veins on that leaf looks. They really pop and that was my first attempt. I've decided to give it to one extremely lucky IHAN blog reader. I know, I can't believe I'm giving it away either. Thank you Susan for the pleasure of allowing me to give away a copy of your latest DVD, Master Machine Stitching- Thread Sketching Beyond the Basics, here on the IHAN blog!! Lets see....something different this time.....hmmmmm....ok I got it.....go over to Susan's Website and look at the Art Quilts she has in her Gallery. Come back and leave a comment about the Quilt you like best and why. A winner will be drawn by random on Sunday Evening, November 21st. Feel free to tell your friends or post about this giveaway on your blog or facebook. You might want to become a follower of the IHAN blog so you will see the post about the winner, if you are not already. I am a follower of Susan's blog and I think you should strongly consider becoming a follower on her blog as well. She is a wonderful writer and I have always enjoyed her posts...I know you will too.